If you want to eat food when it is at its most nutritious, at its freshest and most likely at its cheapest too, then you need to be eating food which is in season! So what is in season at this time of year? To name but a few we have brussel sprouts, beetroot, leeks, swede, chestnuts and red cabbage and seabass, oh and don’t forget the hare! My Mother was the person who always made the Christmas Pudding in my family no matter who happened to be hosting Christmas Day and, I have to say, that it was a particularly good Christmas Pudding! 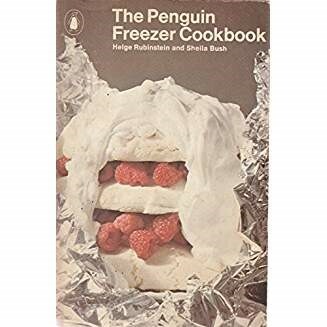 ‘ The Penguin Freezer Cookbook,’ 1973. It’s my turn to make the Christmas Pudding this year and to revisit this absolute gem of a book which not only provides some fabulous recipes but a fascinating piece of history in terms of how people were thinking about food and the use of mod cons at the time. Before freezers became standard in every household people had no choice but to buy food in season so it was always at its ‘freshest, cheapest and most plentiful,’ and what is more it will have been at its most NUTRITIOUS! This premise holds true in this book, you still buy food at its, ‘freshest, cheapest and most plentiful,’ but you freeze it enabling you to eat these foods at other times of year. Makes sense, but is this how we have continued to use freezers in the years since? I would say not on the whole unless you happen to be a keen allotment gardener! When my parents got their first freezer in the 70’s, they really did use it Penguin Freezer Cookbook style. In the early 80’s my Mum who already had a full-time job decided to do a B.Ed. She was short of time to prepare meals and still had one child at home and I remember coming home from university one holiday to find that things had changed, the freezer was full of frozen pizzas and fish fingers. I think this is how most people now use their freezers and the supermarkets are big on catering to this market. We do seem to have lost the plot when it comes to eating foods in season and the potential health benefits to be gained from doing so! I feel that this is down to an over use of freezer foods, convenience foods generally and imports of unseasonable products from all over the world. My simple message to you here is Eat in Season! Which brings me nicely back to hare. The Penguin Freezer Cookbook majors on hare as a seasonal food for December, there are literally 6 hare recipes! Well you’re probably not going to be putting hare on your shopping list tomorrow, but it wouldn’t be as daft as it sounds. Hares are wild animals which have run around free to eat what nature intended! From a health perspective can food really get any better than that? And is the, ‘The Penguin Freezer Cookbook,’ still in its plastic bag? Well no it isn’t, it was loving restored and rebound by my daughter Abi who gave it to her Aunt as a present. So hopefully the family tradition of the Christmas Pudding will carry on for years to come and future generations can have a good laugh about people eating hare in the 70’s like the Martians in the Cadburys Smash advert! Here is a recipe for Red Cabbage from The Penguin Freezer Cookbook which makes a lot of sense. When I buy red cabbage its always more than I need, I shred it into my salads in small quantities and it is always in danger of getting past its best before I’ve used it all. As a hot vegetable it takes ages to cook so it make so much sense to cook more than you need and freeze it in smaller quantities.Cooked Red cabbage freezes very well, it doesn’t spoil it almost improves! ← 9 foods nutritionists never eat! Yes I was looking at hare in the butcher. We had partridge tonight and sprouts! Do you have the recipe for the Christmas pudding? I’ve only made it once and it was awful. Still on the 2 week plan with some relaxations and weight is dropping. The stewed apple did it! I will copy the Christmas Pudding recipe and drop it round for you. Pleased to hear you are still losing weight on the Fat Burner diet!